This bundle includes the M1GSYS3 kit plus M1KP2 keypad - if it is not showing in stock, don't worry, we will build a kit for you as needed! With 16 standard input zones expandable to 208 zones, the M1 Gold supports all standard alarm contacts, 2 and 4 wire smoke and CO detectors and up to 144 wireless sensors (requires M1XRF2G wireless expander). It also has 13 on-board outputs for automating garage doors, door strikes and other hardwired events. With the M1 Gold's standard telephone interface, any telephone in the house becomes a keypad, and you can dial in from your cell phone or remote location to check temperatures, check alarm status, arm/disarm the panel or control lights & appliances! 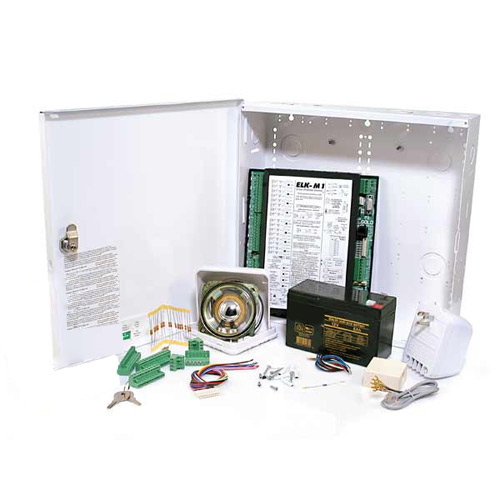 M1GSYS4S Kit includes: Board in 14" enclosure, transformer, Battery, Speaker, telephone RJSET, ElkRP (download), M1KP2 keypad.